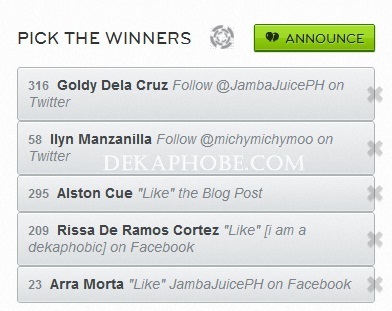 [i am a dekaphobic]: The Winners of the Jamba Juice Giveaway! Again, each of the five (5) winners will receive 3 vouchers of Jamba Juice vouchers valid for a 16oz smoothie indicated in the voucher. The vouchers are valid until July 21, 2012 at all Jamba Juice stores in the Philippines: Bonifacio High Street, Alabang Town Center and SM Mall of Asia. Congratulations to Goldy Dela Cruz, Ilyn Manzanilla, Alston Cue, Rissa De Ramos Cortez and Arra Morta! You will be receiving an email from me on how to claim your prizes or you may just email me at michymichymoo@dekaphobe.com as soon as you read this post. tnx so much, hoping to win again on next giveaways... thnx and more power! congrats to the winners and to you for this successful giveaway... hope there's more to come... Yahweh bless. congrats sa mga nanalo.....until next time..